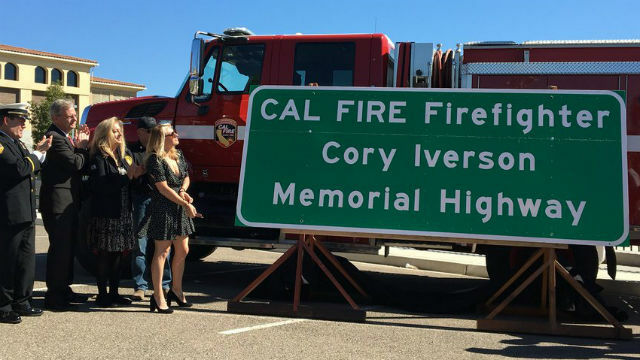 Cal Fire and Caltrans dedicated a section of Interstate 15 Saturday to Cory Iverson, a 32-year-old fire engineer who died in December 2017 while fighting the Thomas Fire. Iverson had served with Cal Fire for more than eight years when he died of burns and smoke inhalation while battling the fire, the largest in state history at the time. Iverson left behind a wife, Ashley, and two daughters, Evie and Taylor. After Cory’s death, a GoFundMe campaign raised more than $700,000 for the Iverson family. Ashley Iverson has since started a foundation, the Iverson Foundation for Active Awareness, that helps firefighters deal with the rigors of the job in a healthy and supportive way. The dedication ceremony was held at the Del Lago Transit Station.